I’ve been shocked time and time again at the food prices lately. 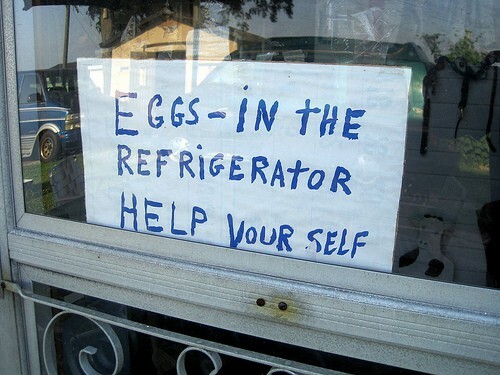 Especially eggs. I’m so used to buying organic, cage free, I mean, free-roaming, no, “happy” eggs that I don’t even flinch, or pay attention to, at the $4/dozen prices. The chickens supposedly roam the farm, without being caged, and eat organic feeds. I buy the same eggs from either at the farmers market ($4/dz) or from Whole Foods ($3.99 to $4.99). But the other day, I ran out of eggs but didn’t want to drive to Whole Foods so I went to a local supermarket. I stared at the huge egg section and got lost. The prices and the variety of eggs just got me so confused. I thought there were just ‘caged’ or ‘cage free’ and ‘organic’ or ‘conventional’. But no. There were: cage-free, free-roaming, pasture, organic, omega-3, free-range, vitamin added, and farm-raised. Arggghhhhh…..and all the different prices!! (And why should my life be easy?) I just picked up a half dozen organic eggs ($3.99/half dz) and drove home, shaking my head in disbelief that buying eggs was this difficult. And expensive! So, to figure out what all those labels meant, I did some research and found out that eggs are not as simple as they look. According to U.S. Department of Agriculture, Cooperative Extension Service, University of Florida, there are two main categories – Designer and Specialty – and while most common eggs in the US are white eggs from the While Leghorns, there are myriad of different ways to raise or feed the animals, resulting in all those confusing varieties. DESIGNER EGGS: to put it simply, these are eggs the content has been modified from the standard egg. You may not see some of these on your store shelves but they do exist. Vitamin content: Currently, vitamins, A and E, are receiving the most interest as components of designer eggs. The vitamin content of the egg is variable because the hen absorb different vitamins into the egg with different efficiency. So although, the hens were fed with vitamins, and the label might indicate vitamin contents, there is no guarantee that the eggs actually contain those vitamins. Lowered cholesterol: In order for a company to claim a reduce amount of a nutrient the product must have 25 percent less than the normal product standards for that nutrient. A large egg contains approximately 200 – 220 mg of cholesterol. Egg cholesterol is found only in the yolk. By genetics, some chickens lay smaller yolked eggs so naturally, those eggs contain lower cholesterol. But there are artificial ways to lower cholesterol in the eggs and that’s by diet and pharmacological intervention (drugs). Drugs have been successful in lowering egg cholesterol by as much as 50% but those drugs are not yet approved by the FDA for commercial use. Chromium supplementation to laying hen diets at concentrations of less than 1 ppm have been shown to lower egg cholesterol and also improve egg interior quality. 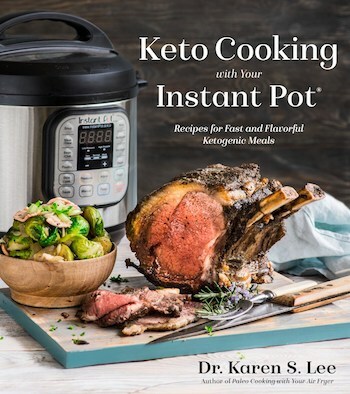 But the researches have shown that most effective way to lower cholesterol content is by feeding a special all-vegetarian diet that is higher in protein and fiber, and enriched in vitamin E.
Fat and fatty acid content: Altering the total fat content in the diet of the hen has little effect on the total fat content of the egg yolk. However, the fatty acid profile (or the ratios of the different types of fatty acids) of egg yolk lipid can easily be changed, simply by changing the type of fat used in the diet. 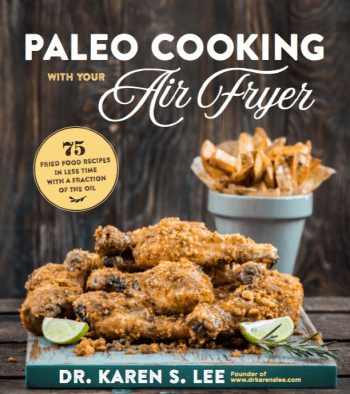 Different feeds, such as flax seed (linseed), safflower oil, perilla oils3, chia4, marine algae, fish, fish oil, and vegetable oil have been added to chicken feeds to increase the omega-3 fatty acid content in the egg yolk. They typically have a darker yellow yolk. Canola oil is commonly used to alter the ratio of saturated to unsaturated fatty acids. Pharmaceuticals: New biotechnology is being used to develop genetically modified chickens that produce compounds that can be harvested from the eggs. These compounds include insulin for the treatment of diabetes. The hen, like all animals, produces antibodies to neutralize the antigens (viruses, bacteria, etc.) to which she is exposed to each day. These antibodies circulate throughout her body and are transferred to her egg as protection to the developing chick. Immunologists are taking advantage of the fact that the hen can develop antibodies against a large array of antigens and concentrate them in the egg. Specific antigens are now being selected and injected into the hen who develops antibodies against them. As new biotechnology knowledge is gained in this area, designer eggs in the future may be produced that result in a range of antibodies for treatment against snake venoms to the countering of microorganisms which cause tooth decay. So, are we confused yet? Wait. There’s more. 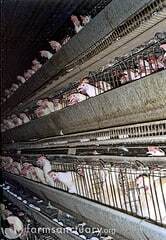 T he majority of eggs come from caged in hens – some in deplorable conditions. There are some advantages to caging of hens for the birds, consumers and producers. The separation of birds from their feces can reduce the risk of diseases and infections. 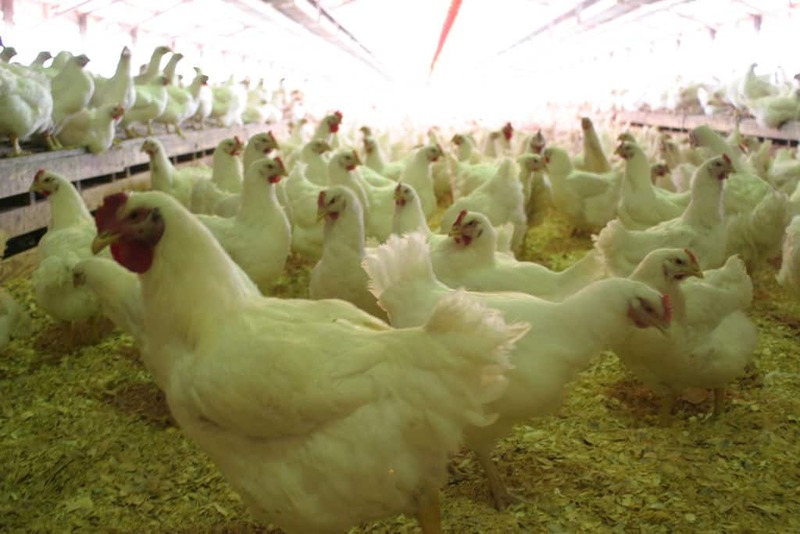 Working conditions for producers are often better with cages – reducing the amount of physical labor, and dust and ammonia are usually less prevalent. Eggs are laid on the sloping floor of the cage so that there is minimal contact between the egg and the hen which decreases the possibility of bacterial contamination of the egg. With regard to the welfare of the laying hens, cages have both advantages and disadvantages. While there are claims that keeping the birds somewhat separated from a huge flock, reduces fighting among the birds, there are arguments that state that caging the birds all the time creates deplorable conditions where diseased and sometimes dead birds are mixed in with live birds. There’s also the inhumane treatment of the caged birds by debeaking – searing off their beaks or cutting them in a machine so that they don’t peck and kill each other. The modern egg farms are so automated now that with this system, they are able to process unseen number of eggs a day. You can see how chicken farm is far from the idyllic picture of hens roaming, and laying eggs in their coop at their own pace and will. Furthermore, who can forget this recent undercover video from Mercy for Animals of Hy-Line North America workers throwing live male chicks into the grinder, just because male chicks don’t lay eggs and are not profitable since they grow too slow to sell them as poultry meat. That’s destroying 50% of the chicks. Cage-Free or Free-Roaming: These eggs are laid by birds that are not caged. But, “cage-free” does not mean that the birds are raised outdoors. Typically the birds are maintained on the floor of a poultry house. Often the packaging of “cage-free” eggs can mislead the consumer about the product they are purchasing. It is common to see designs on the egg cartons including chickens roaming free outdoors. This is not the case with “cage-free” eggs. The hens are still maintained indoors, just not in cages. 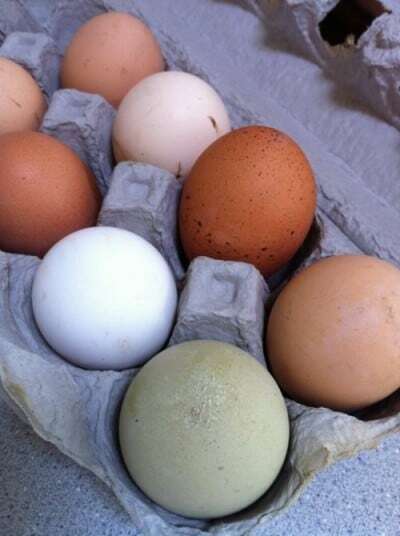 Free-range: These are the eggs from hens that are allowed to graze or roam outdoors. It is not necessary, however, for the hens to be outdoors all the time. In other words, the hens, housed in a poultry house that has access to the outdoors, have the ability to go outdoors during the day, although they can also choose to stay indoors. The flock is usually locked indoors at night to protect the hens from predators. There is no set standard on how much range must be available for the hens. This means, they can stay outside for five minutes or for five hours. Pasture-raised: This is a modified “free-range” system. The birds remain on pasture all the time, but are confined within a portable pen. The pen is moved daily to give the birds access to fresh pasture. The portable pen usually has a portion covered to protect the hens from the elements. Organic: To be certified organic, the eggs must be produced from hens that have been fed certified-organic feed which was produced without synthetic pesticides or herbicides, antibiotics, or genetically-modified crops. In addition, no synthetic pesticides can be used to control external and internal parasites. However, organic eggs can come from chickens that were given antibiotics in the event of an infection. Most commercial chickens are given antibiotics routinely, without an infection. Also, typically, organic eggs are also produced from hens in cage-free systems. So now do you see what my problem is? Once I started really caring about the labels slapped onto the egg cartons, (and actually reading them) I realized that there are dizzying array of ways that the eggs are produced. I thought about chickens we raised in our backyard in Korea. I don’t remember why we raised them but only that they were like pets. We only had about ten in a large pen big enough for us to walk around in and give them their feeds. I remember collecting warm eggs, that they just laid, in a basket every day. I wish we can raise our own chickens again. Do you know you can buy a White Leghorn, the most common egg laying hen, for less than two bucks? That’s $2 for a indefinite number of fresh eggs! Hmmm…I wonder what my Home Owners Association would say about clucking hens running around the yard? Have you thought of raising your own hens? Do you know someone who does?